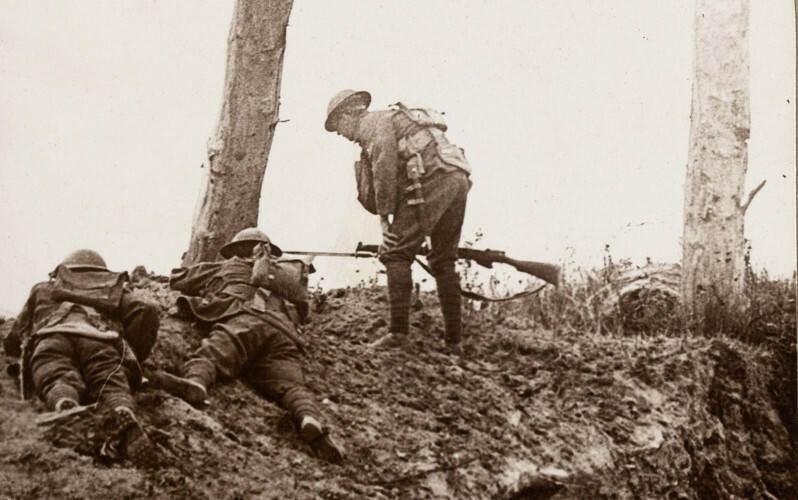 The diary and associated documents of Second Lieutenant Eric Hall show the strain felt by British soldiers pushed to their limits in the final stages of the Battle of the Somme. The struggle on the Somme continued throughout September and October 1916, with fresh attacks repeatedly launched by the Allies. As the weather deteriorated, the communications and logistics system behind the lines began to break down. Men tried to maintain the infrastructure in appalling conditions, as the chalk soil of the Somme soon turned into a sticky quagmire. Finally, on 18 November, General Sir Douglas Haig shut down the offensive. For an advance of seven miles (12 kilometres) the British Empire had suffered 420,000 casualties and the French 200,000. German losses were at least 450,000 killed and wounded. In his official dispatch Haig maintained the operation had achieved its objectives. While it is true that the German Army had been permanently worn down by the Somme fighting, the British were also beginning to show the strain as the offensive petered out. 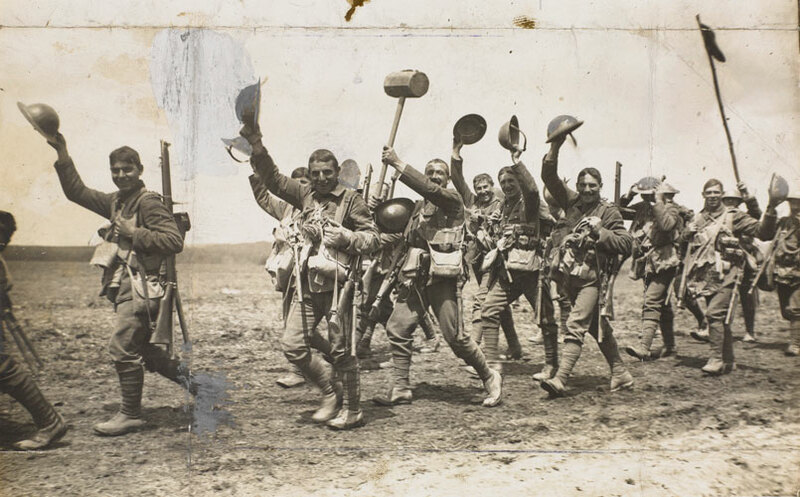 The diary of Second Lieutenant Eric Hall of 2nd Battalion The Hampshire Regiment gives us an insight into the state of mind of some of the troops at this time. Having served on the Somme throughout July, his unit now took part in the Battle of Le Transloy (1-18 October 1916), assaulting the German lines on the outskirts of Gueudecourt. 11 October: Marched up into the support trenches on the right far side of Delville Wood. Beastly old trenches with guns popping off in ones ears. One can realise what the fighting has been like. About 10 o’clock we moved up into Bulls Road Trench (behind Gueudecourt). 13 October: After a very cold day in Bulls Road Trench we moved up and reinforced the Newfoundlanders who had captured Hilt Trench that afternoon. On starting to consolidate Hilt Trench we found that a great deal of German stuff had been left behind. We had to bomb the Boche out of part of the trench and took about six prisoners. The Boche counter-attacked in the evening but failed. 16 October: Lieutenant Corke’s nerves went and he left us. We were relieved tonight by the Essex Battalion and withdrew to Bulls Trench without any casualties. 17 October: In the afternoon I went to Brigade Headquarters with the commanding officer and was told that I am to take charge of the new mining company. 18 October: Took over the mining company. The battalion moved up into the front line at Gueudecourt to attack the next morning. At night I was sent over to the 71st Brigade as liaison officer. Got there about 2.0 am the next morning with sopping wet feet. 19 October: Greatly appreciated the general’s help and managed a sleep in the staff captain’s bed during the afternoon. Returned to our own Brigade Headquarters at night, where I sleep in a German dugout with the brigade signalling officer. 20 October: One of the worst days of my life. Was out in mud and pouring rain, sopping wet through all day, stretcher bearing. Returned late at night thoroughly ‘done in’ having lost my way and tumbled into countless trenches, shell holes etc. 21 October: In the afternoon we marched down to Bernafay Wood. After firing with the Stokes Gun… had sleep in a tent. The weather is freezing cold. Our mess is a hut made of boxes and tarpaulin. Just behind us there are two big naval guns which keep popping off. They are a fearful nuisance. 22 – 29 October: The weather has quite broken up. We are working on mending roads, salvaging material etc. We get a few shells into the camp. 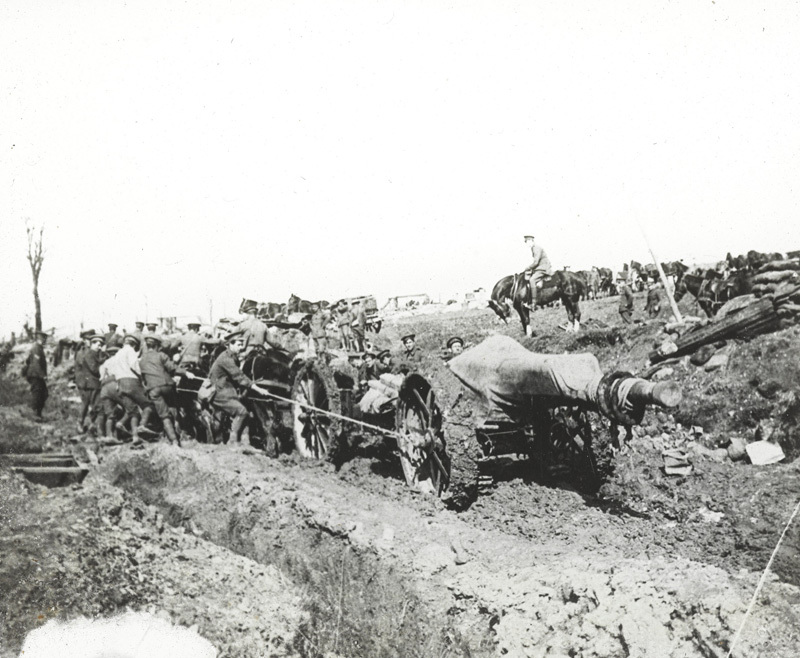 One road which we work on is fearful; an officer got fast up to his waist in mud one day and we keep digging up dead horses… Our Brigade Headquarters are down a quarry out of which lead wonderful German dugouts. On the 27th the battalion went into the trenches for a short spell. Everyone was fearfully fed up about having to go up. 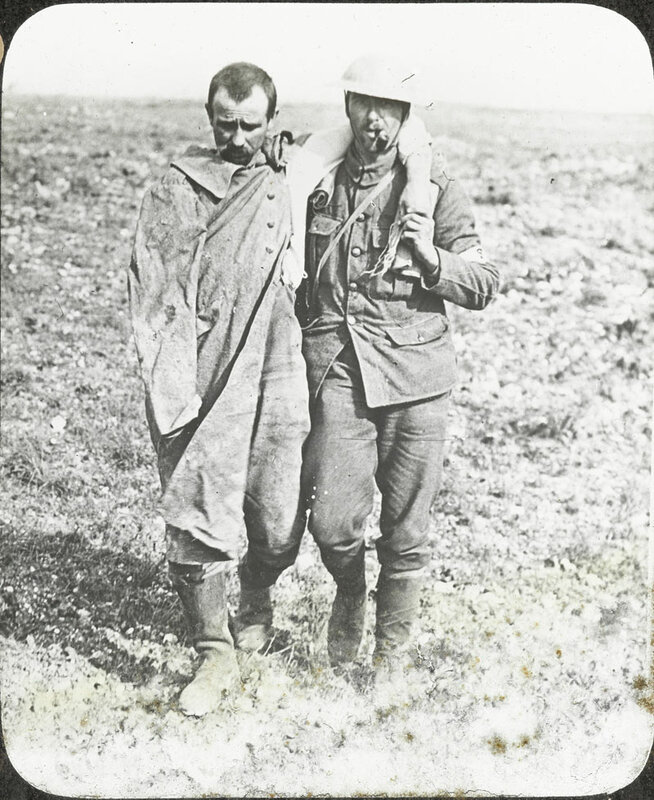 The casualties during and after the attack on the 18th October were very heavy. Lieutenants Aitcheson, Cain and Elton were killed, Sergeant Major Rideout is missing and amongst the wounded are Lieutenants Gilman, Rutherford, Gravely and Graham. Lieutenant Todd had shell shock and Captain Cudden and Lieutenant Baxter had to go away ill. The Field General Court Martial Book of the 88th Brigade, to which Hall’s battalion belonged, also shows an increase in cases for the October-November period, suggesting that some men were at breaking point after weeks of service on the Somme. Several, including men from Hall’s battalion, were charged with shooting themselves in the foot during the attacks of 13-15 October, the classic resort of those desperate to escape further active service. Another man from the 2nd Hampshires was sentenced to death by firing squad after ‘Deserting His Majesty’s Sevice’. Like most death sentences passed by British military courts, this case was commuted to penal servitude. Out of the 3,000 men sentenced to death during the war, around 90 per cent were reprieved. 306 men were executed. Eric Peace Hall (1893-1967) was born on 1 January 1893 in Sheffield. He was the son of Henry Arthur Hall and his wife Fanny Elizabeth. He had one sister, Helena. In 1911 his family resided at 17 Ryle Road, Sheffield. After leaving school Eric was an engineering apprenctice and studied engineering at Sheffiled University. Hall was commissioned as second lieutenant on 9 June 1915 and posted to the 13th (Reserve) Battalion The Hampshire Regiment. After training at Bovington, Devonport and Codford he left Southampton on 16 February 1916 aboard the SS ‘Olympic’ bound for Egypt. He landed at Alexandria on 25 February and was attached to No. 1 Composite Battalion of 29th Division. On 16 March 1916 he was transferred to the 2nd Hampshires, part of 88th Brigade of the same division, eventually joining it on the Western Front at Rouen in April after travelling back from Egypt via Marseilles. He entered the line near Belle Eglise on 25 April 1916. At the end of the month the battalion was transferred to the Ypres front in Flanders. In August 1916 it lost 101 officers and men during a German gas attack. In early October it returned to the Somme with 88th Brigade, which was now attached to 12th Division, entering the line near Longueval. Hall’s battalion continued to serve on the Somme until the end of October. It remained on the Western Front for the remainder of the war. However, in January 1917 Hall was attached to 455th Field Company, Royal Engineers, for three months, during which time he constructed dugouts near Trones Wood before taking part in the fighting at Monchy-le-Preux during the Battle of Arras (9 April-16 May 1917). In June 1917, while on leave in Britain, Hall was admitted to the 3rd Northern General Hospital in Sheffield for an operation. Following convalescence in Harrogate he joined the 3rd (Reserve) Battalion of the Hampshires at Gosport, spending the remainder of 1917 stationed there. Sent to Egypt again, Hall arrived in Alexandria in February 1918 and was posted to 2/5th Battalion The Hampshire Regiment, serving with it in Palestine with 75th Division. In April 1918 his battalion suffered heavy casualties during the Battle of Berukin (9-11 April 1918). Following the disbandment of the 2/5th Battalion in August 1918 he was attached to 496th Field Company, Royal Engineers, and then to the Royal Engineer headquarters staff of 7th (Meerut) Division, going on to serve at the Battle of Megiddo (19-25 September 1918). After the war, Hall returned home to wed his sweetheart Nellie. In April 1919 he received official notification of his transfer to the Royal Engineers. He was then stationed in Eygpt, but left the Army soon after in July 1919. In 1939 he returned to the colours with the Royal Engineers Reserve, and after a brief refresher course served as garrison enginer at Jamrud on the North West Frontier. In June 1943 when he transferred to Risalpur district. Hall retired from the army in 1946, and was granted the honorary rank of major. He died in 1967, in Bakewell, Derbyshire.